The cross-country Martlets are back at the head of the pack in Quebec. 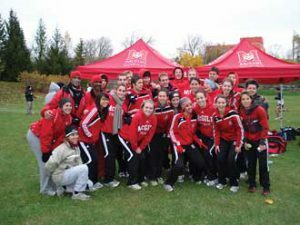 Led by Sarah McCuaig’s first-place finish, the McGill women’s team swept to a convincing victory in the Quebec university championship meet Oct. 30 at the Centre de la Nature in Laval, north of Montreal. The cross-country Martlets are back at the head of the pack in Quebec. Led by Sarah McCuaig’s first-place finish, the McGill women’s team swept to a convincing victory in the Quebec university championship meet Oct. 30 at the Centre de la Nature in Laval, north of Montreal. The Martlets had won the title for 20 straight years before coming up short in 2008 and 2009. McCuaig, a second-year physiology student from Waterloo, Ont., capped her outstanding season on a chilly Saturday afternoon by covering the leaf-strewn 5-kilometre course in a briskly paced 18:12 – 14 seconds ahead of runner-up Joanie Roy, of Université Laval. McGill’s Charlène Puel, a third-year mathematics student from Lyon, France, placed fifth in 18:48, while Madeleine Cummings, a second-year English student from Toronto finished sixth in 19:13 despite a knee condition that has hampered her in recent weeks. Rounding out the scoring for McGill were Catherine Drouin-Audet (fourth-year, dietetics) from Repentigny, who finished eighth in 19:28 and Aimee Castro (second-year, pharmacology) from Hamilton, Ont., who placed 11th in 19:45. The strong supporting cast helped McCuaig sustain her quick pace. “When your team is on the line and you hear people calling out the names (of teammates) behind you, you feel like you’ve got to,” she said. The 31-point total for the Martlets’ top five runners gave McGill a comfortable margin of victory over Laval, which finished second with 46 points. Université de Sherbrooke came in third, with 62 points. Earlier in the day, in the 10-kilometre men’s race, first-year science student Jay Boychuk paced the McGill team with an impressive third-place finish. The 17-year-old from Pickering, Ont., posted a time of 32:21, 23 seconds behind winner Olivier Lavoie of Sherbrooke. Oliver Foster (10th, 33:46), Daniel Kramer (11th, 33:52), Graydon Snider (13th, 33:53) and Ian Forbes (23rd, 35:05) rounded out the scoring for the Redmen, who finished fourth in the team standings with 60 points, behind Sherbrooke (43), Laval (53) and Concordia (57). For Coach Dennis Barrett and his staff, the Martlets’ victory after a two-year drought was especially sweet. “I was devastated two years ago” when the team was upset at the provincial championship, said Barrett, who started coaching the team in 1988 and led it to the Quebec title every year through 2007. The smooth-striding, 5’-10” McCuaig was named the Quebec conference’s female athlete of the year following the Oct. 30 race. A volunteer at Royal Victoria Hospital, she also received the conference’s community service award at the post-event ceremony. Barrett won coach-of-the-year honours on the women’s side. On the men’s side, Boychuk was named rookie of the year. The next test for the Martlets will be the CIS national championships in Sherbrooke on Nov. 13. Whatever the outcome in Sherbrooke, Barrett knows that he now has a solid core of young runners to build on for the next few years.